Studio Apartment with King and two twin beds. Great view of pasture and trees. This is a great space for a weekend getaway or simply a place to unwind while traveling. Situated on 3.5 acres surrounded by trees and wildlife outside and wonderful art and décor inside you're sure to enjoy your stay. There's lot's to do both inside and out. The Apartment, as we've called it for years, is a wonderful space to hang out. Guests can enjoy the entire 3.5 acres. There are a number of outdoor seating spaces, a hanging bed, horseshoes, corn-hole boards, waterfall and koi / goldfish pond, fire-pit and much more. Our family lives on site. This space was converted to a studio apartment about 12 years ago. The property is located in a quiet neighborhood and is a great place to get out and take a walk or run and enjoy the scenery. The Apartment is a companion property to The Barn which also sits on this 3.5 acres. Should you have a larger group looking for somewhere to stay you could consider renting both spaces. Our family has lived here since 1995 and fell in love with the property as soon as we drove down the driveway. Our 5 children have all grown up here and this place is filled with many incredible memories. My wife is an artist and our house and The Barn are filled with many of her paintings and special touches. I enjoy working around the property. I am a licensed Realtor and assist clients to find their unique property. The surroundings make you want to just sit around and relax but once outside you're sure to enjoy the beauty of the property. Lot's of trees and wildlife to keep you entertained. The Barn is close to I-65 (5 minutes) and is only 6 to 7 minutes from the University of Montevallo campus. I fell in love with the property when I first drove down the driveway over 24 years ago. since that time we've made a lot of changes to make the property suit our lifestyle. We think you'll enjoy the uniqueness of staying here. 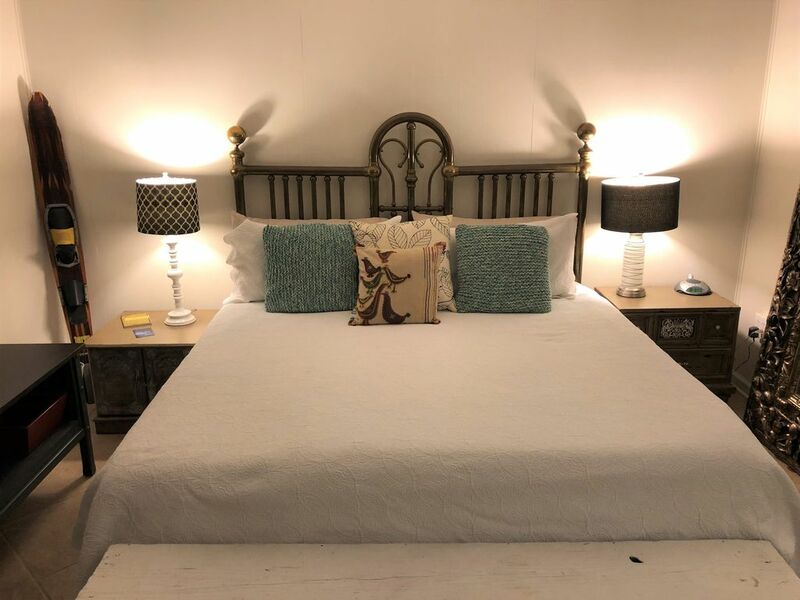 The Apartment has 2 other companion spaces, The Barn and The Art Gallery, so if you have a larger group you could consider booking these other spaces as well. Central air conditioning is provided. Central heating is provided along with a supplemental space heater that is available if needed. Plenty of linens are available for all beds. Easy access to the Apartment from the driveway. Plenty of towels are provided for guests. There is an exercise bike available in one of the stalls behind The Barn. Two twin day beds for lounging, watching television, playing games, reading, etc. Two eye hot plate is available in The Apartment. Coffee maker along with coffee and necessary condiments are provided. Dishes, glasses and flatware are available along with utensils for meal preparation. If something additional is needed owner can typically provide. Efficiency kitchen with full sink, cabinets, counter and table that seats 4. Dining area is available with seating for 4. Local TV stations are available along with a Netflix subscription. A Bluetooth speaker is available so that you can enjoy listening to your music. Several books are available for reading. Additional titles can be provided upon request. There is an adjacent Game Room. Please ask host about availability. The Game Room has a pool table, with a ping pong table covering and a Foosball Table that has a table top on it. Games and puzzles are available for your stay. Pool Table may at times be available for guests. Ask host about availability. A large number of DVD's are available as is Netflix. Beautiful flowers, trees and surround the property. Lots of wildlife (brids, squirrels, deer, turkeys, hawks, etc.) to enjoy. There are bikes available for use. Both a deck and patio are right outside The Apartment. The deck houses a hanging bed where you can relax or even spend the night if you'd like to enjoy the outdoors. Timberline and Ballantree golf courses nearby. Great place to spend some time whether you're looking for a short getaway or just passing thru. You'll want to stay. So much to do around the property. Great place. Great hosts. We will be back! Very clean facility. Outside grounds were well kept and relaxing. I will stay here again on next trip to Alabama. A very nice place to stay and relax. Beautiful place in the country but still close to town. Owner very friendly and accommodating. Very comfortable bed. Would definitely stay again. Don't stay in a hotel, stay here. Great place to stay. Owners are extremely hospitable! We truly loved our stay and Stewart was an amazing host. We stayed in the apartment and the barn. Both where perfect and Stewart we incredible. We wanted for nothing and our 19month old loved the grounds. Beautiful property, the most gracious hosts, perfectly appointed. Thank you for everything and for making the stay wonderful!